Kris Verburgh (1986) graduated as a medical doctor from the University of Antwerp, Belgium. 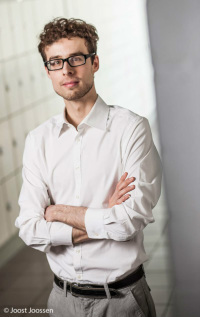 He's a researcher at the Center Leo Apostel for Interdisciplinary Studies (CLEA) and member at the Evolution, Complexity and Cognition research group at the Free University of Brussels. Dr Verburgh's fields of research are aging, nutrition, metabolism and health. Besides medicine, Dr Verburgh has a keen interest in evolution, the origin and complexity of life, and neuroscience (consciousness, neurotheology, neuroesthetics, theory of mind and the origins of creativity). At the age of 25, he was the author of 3 science books. His books got many reprints and nominations. He wrote his first book at the age of 16, making him the youngest author of a science book in Europe. This book was nominated for the Eureka Science Prize. In his second book, that Verburgh wrote at the age of 21, he draws on recent scientific discoveries and insights to answer age-old philosophical questions about the origin and evolution of life, human nature and consciousness. The book got 7 reprints and was also nominated for the Eureka Science Prize. In his third book The food hourglass Verburgh writes about a subject that is a strong interest of his: the aging process. In this book he uses latest scientific insights to explain how different kind of foods and food patterns can slow down or speed up the aging process. Because of his book Verburgh was nominated as one of the Most Important Persons of the Year. Verburgh wrote articles for various newspapers and appeared in radio and television shows. He regularly gives lectures on medicine, health, aging and science. More information on www.krisverburgh.com or visit Dr Verburgh's research page.